Tea Trekker is happy to have been able to source our Longjing Xihu again for 2018 and have it in our collection of fine Longjing teas. Harvested right on the borderline of the pre-Qing Ming and Yu Qian seasons, we are still referring to it this year as a YuQian, because its flavor is more in that style. This year was a good year to continue with this regional specialty because it is a good example of the effect that more traditional weather has on the fresh buds and leaf of a tea plant. The 2018 harvest of green teas in eastern China was significantly quirky this season, with some gardens picking early and most picking at the traditional moment, and there are a few whose coolness dictated a bit of a delay, although not as much as last year when most of the 2017 crop was very late (two to three weeks). For the Longjing teas harvested from the traditional region around Hangzhou, the leaf is very normal in appearance, showing the beauty of a ‘normal’ harvest. Visually, the 2018 harvest Longjing leaf is generally medium-small and slightly varied in size & shape. The color is bright and lush green in color, and a small percantage has the coloration that tends more to the lighter ‘straw’ color. Because the season started out cool and humid (there were significant rains early just before harvest time, which is good for tea plants) so at the time that harvest normally begins, picked leaf took on a richer color due to this increase in moisture. The tea is deeply-flavored and lush and will keep well. It is tending to be not as astringent as many years. Taste-wise and aroma-wise, Tea Trekker’s Longjing Xihu 2018 tea is delicious. 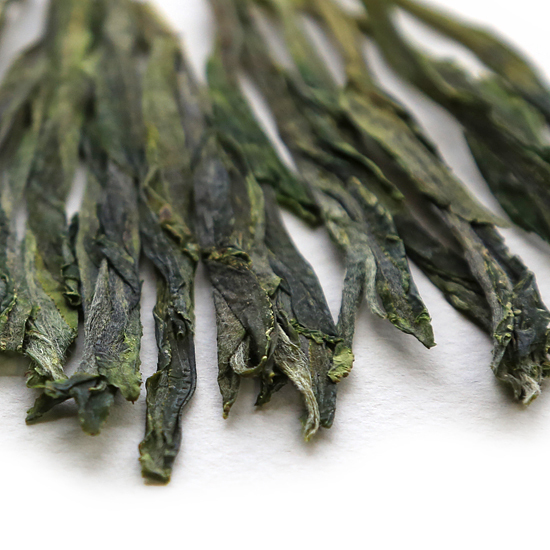 It has the signature taste of an authentic Longjing that combines a toastiness, nuttiness, and rich, smooth flavor with a vegetal freshness that is lively and spirited. From the first sip of the initial steeping right through to the lingering taste of the last cup of the final steeping, Longjing Xihu fills the palate with satisfying flavor. It has a bright snap if you steep it just a little bit longer than 2 minutes for a first steeping, or it is smooth as silk if you stop the first steeping at 90 seconds. The second steeping is far better than you probably expect and we even squeeze a third steeping from these flavor-packed leaves by using less water than for the first two steepings – but don’t steep it too long! Of course, the domestic market in China steeps the leaf many more times, but they tend to appreciate a more subtle cup than do most tea enthusiasts in the West. Longjing Xihu is also extremely refreshing if allowed to cool and then drunk when almost cold. What a fabulous palate refresher. Longjing tea is the pride of Zhejiang Province where it has been made for many centuries. This fine Longjing is plucked in tea gardens located within the Xi Hu designated Longjing region in Xin Chang county, although not specific to any one village or garden. There is a long history of tea cultivation and tea drinking in this region: much of it began centuries ago to supply the needs of the resident monks and visiting scholars at the Buddhist Temples of the region going back to the 4th century BC. Pre-Qing Ming teas command the highest prices because the demand for these teas outpaces the supply each year. This is especially true for the Famous Teas such as Long Ding and Longjing, and the fever for these teas hits in China as well as in the West. This Longjing was harvested just at the break between Qing Ming and Yu Qian. It has many traditional characteristics of both periods and is especially delicious this year, we think. The moisture content was perfect for the pan-firing that Longjing receives and the finish firing ‘set’ the leaf well for long storage and easy drinking.